We don’t always notice where our food comes from. There are tomatoes and potatoes that come from America, citrus fruits that come from the Far East, and there is beef, which comes from cows that prefer a chilly climate and a pasture turning green. People tend to think that as we discover more of the world we eat a greater variety of foods, but a simple check will show that that isn’t always the case. When we had to make do with the food that grew in the area we ate a more varied menu suited to the climate and the changing seasons. We were more familiar with the plants growing in the area, the foods that can be made from them, and where they can be found. We knew more about the plants and how to use them for our benefit and our health. Although we are involved in preparing and arranging food, food is more the result of location and less of people. It grows in the local earth, drinks the rainwater, breathes the air, whether clean or polluted, and gets the rays of the sun that hit the earth. Historically speaking, local food is the most suited to the earth, to botanical balance, and to us. We also enjoy eating food from around the world, but in our kitchen we give pride of place to local food that comes from the ground beneath our feet. Hummus is one such food. While not specifically Israeli - it’s eaten in Lebanon, Egyt, and parts of Syria - it is strongly connected to the local earth and the traditions linked to the earth. This is why it has a place of honor on our table. The chick pea is a legume that grows in the winter. Hummus is a winter food, and isn’t at its best in the summer. There is an old claim that when it comes into contact with hot air it spoils, and goes bad in the stomach even before it is digested. This means you should eat high-quality, fresh hummus. When cooking chick peas at home it’s very important to sprout them first because the process slows down spoilage and makes it easier to digest them. Hummus is best eaten for breakfast, fresh and hot, so that no other food slows down its digestion and it doesn’t cause gas. 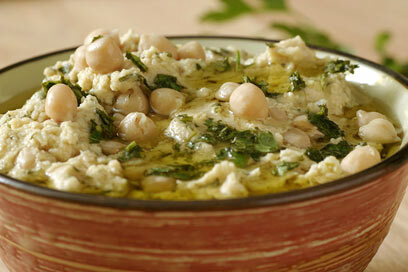 At other times of the day hummus should be eaten by itself, without other food. When eating hummus outside the home, make sure that it’s prepared on the premises, that it’s served fresh with high-quality olive oil, and that it’s not prepared with baking soda. Organic hummus and tehina are best. We have purposely not mentioned pita, since hummus is better eaten without pita, though you can eat it with a bit of onion or alone on a spoon. When chick peas are cooked put ¾ of them into a food processor, add the sesame butter, the juice of one lemon, the pinch of salt, and two cloves of fresh garlic. Add the cooking water, more if you prefer thinner hummus, less if you like it thicker. Grind for several mintues until the hummus has the correct consistency. Chop the parsely and the cilantro very fine and mix in the juice of two lemons. Place the hummus in small bowls, mix with a few chick peas and the parsely and cilantro, pour on a bit of olive oil and serve. Tali and Uri Mayer-Chissick live in Kfar Yehoshua, cook and eat healthy foods, and are Aya’s proud parents. Tali markets organic food, and Uri is a nutritional consultant, a researcher, and a nutritional history expert. Uri leads cooking workshops and courses on healthful diets . Photos: Assaf Ronen . See all talkbacks "The ultimate Israeli food"